Like most Millennials, I am addicted to my cell phone. I recently switched from an Android to an iPhone, and I'm so glad I did. While I liked that my Samsung phone could communicate well with my Chromebook, the iPhone does fine. There are so many more apps available for Apple products, and the capabilities are much more suited to my lifestyle. Here is a collection of the apps that I use almost every day. Please let me know in the comments if you have any suggestions for your favorite apps! Audible / Overdrive - Probably my most two apps on my phone this year. I listen every morning and afternoon on my commute to work, whenever I drive my car, and sometimes while I'm home cleaning. Audible is great, but can get expensive. I currently have the 1 credit per month subscription plan which works great for now. I recently started using Overdrive to borrow audio books from the library. It is very easy to use, and I love that you can borrow from different libraries. Plant Nanny - This is a relatively new app that I have been using in order to track my water intake. The whole premise is that you are "watering a plant" with every drink you take. You raise a plant, and then keep them in your garden. I have four plants in my garden right now, and I am regularly drinking about 90 ounces of water a day! Every Dollar - Budgeting game. Changer. This app helps you track where all your planned, spent and saved money is going. You still have to add your transactions manually, but you also decide what budget line the money comes out of. As a single earner household right now, this resource is great to monitor our accounts and savings. Wunderground - I think this is the best weather app. It is so easy to use and read, and it is also very accurate. I like that you can see weather patterns, and what is coming up in the future. While other weather apps are good, this one is my favorite. GrubHub / OrderUp - Let's be honest. Who doesn't order takeout once and a while? When we lived in Norfolk, we would order from one of these sites at least once a week. Now that we live in Pittsburgh, it is less frequent, but there are SO many more choices. I love being able to order and pay for pizza right from my phone. SUPER convenient. Do you have a favorite app on your phone? 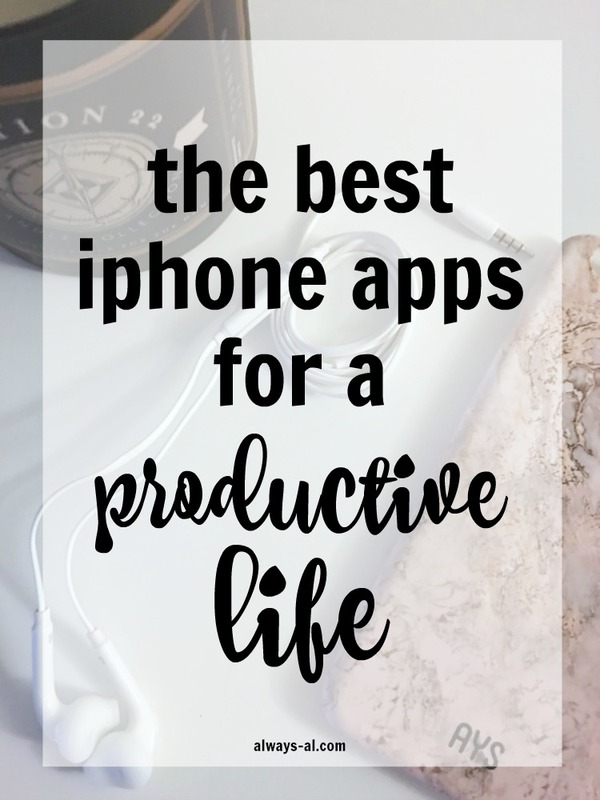 What are your suggestions for using your phone to help live a productive life?